How Long Does A Mosquito Live After Biting Someone? Whenever I tell people the story about the male mosquito diet, people are amazed. It’s very rare that I find someone that knows what male mosquitoes eat. I’m both at war with these creatures as much as I am fascinated by them, so this seems like a good opportunity for learning about what’s for dinner for Mr. Mosquito. And it’s not exactly what you might think, which makes it all the more interesting to learn about. People don’t usually think about what insects tend to eat. I’m pretty sure there are also people that would think that these creatures don’t need to eat at all, because they have such as short lifespan. However, male mosquitoes actually do need to eat. And it’s probably not what you might expect them to be eating. What Do Male Mosquitoes Feed On? Both female and male mosquitoes exclusively feed on sugar, which they will extract as nectar from flowers. This will provide the male mosquito with enough nourishment, but females would need additional protein to lay eggs. This protein is extracted from animal blood or human blood, but not used for consumption. Apart from flower nectar, male mosquitoes will also drink plant sap or honeydew (a sticky substance excreted by aphids). Who would have thought that one of the deadliest creatures to have ever roamed the planet is actually 100% vegetarian! The truth is, males really aren’t that dangerous at all. It’s the females that will do all the blood-sucking and biting. So if you see a large cloud of harmless males, please leave them be! Males tend to have a sole purpose in their short little lives, which is to find a mate and help in the process of producing offspring. Future generations depend on the males to feed on their nectar, in order to make sure they’ll live long enough to mate with a female. In this time, they won’t actually eat (or more accurate: drink) that much at all. How Often Do Male Mosquitoes Eat? Mosquitoes can live quite a long time without eating. 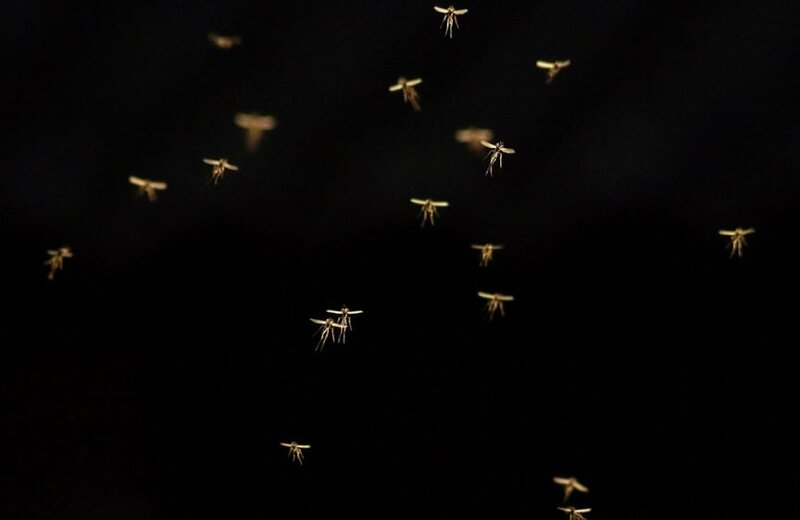 However, the male mosquito lifespan is considerably shorter than it’s female counterpart: Adult males will only live for about 10 days on average. In order to survive, they tend to ‘eat’ plant-based sugar every few hours or so, depending on the species. It’s actually wrong to say that mosquitoes eat, because they don’t eat solid food and they have no teeth to chew anything with. Instead, they use their little mouths to extract those sweet goodies from all the plants and flowers you can possibly imagine. These insects are extremely capable of adapting to certain environments, which is one of the reasons they are so successful. The next logical question would usually incorporate a comparison with (honey) bees, since these are one of the most well-known nectar extractors on the planet. So, let’s check out if pollination makes those useless mosquitoes a little more useful. The answer is more surprising than you might think at first. Mosquitoes play a vital role in ecosystems as pollinators of flowers: Both adult male and female mosquitoes partake in the pollination process. Males will feed on the nectar of flowers and don’t bite people. While female mosquitoes do drink blood for egg production, they also require nectar (resulting in pollination). It’s not like the males will go from plant to plant to take back the nectar to the hive, most of it they simply consume as an individual. The rest of their time is used finding a female to mate with: This is what you see late at night, dancing clouds of males all around! Well, mostly during warmer weather (usually in summer time), obviously. Winter time is way too cold for them to survive, as I explained in one of my earlier articles. Man, there is so much interesting stuff to learn about these little nasty buggers! Would it be possible in that case to produce mosquito honey? Not exactly, because there is no hive to fly back to and there is no interaction with the larvae or eggs after they are placed in water. This makes it impossible for the nectar to be collected in one location enough to be transformed into honey. Furthermore, the biological (and a tiny bit chemical) process used by bees to produce honey is unique to them, so any type of theoretical mosquito honey cannot be produced. It’s a fun and entertaining idea to toss around, but it has no practical use since it won’t work in practice, sorry! So let’s move on to ask ourselves, is nectar the only thing these insects feed on, or do they also tend to drink blood as well. Surprisingly, there is no difference between mosquito genders here either. Do Male Mosquitoes Drink Blood? The idea that male mosquitoes drink blood for their survival is a common misconception: Only females will bite animals and humans for blood, which is done in order to lay eggs. Male mosquitoes are harmless and will not drink blood, yet they do usually drink nectar for their nutritional needs. In many mosquito species, the mouthparts of the females are adapted for piercing the skin of animal hosts and sucking their blood, wheres the males lack this mouthpiece. This makes it impossible for most male mosquitoes to drink the blood of other species. For a male, it would not make sense to do this either, since they do not need to lay eggs and produce offspring (other than mating with the females). So you can rest assured you’re safe the next time you spot a large cloud of mosquitoes hovering around your garden at night, because all they will really do is attack some plants. No biting or sucking blood of any kind involved in that. The worst that could happen is that you swallow them whole, which is gross. The question is, what else do these mosquito males swallow whole? Do Male Mosquitoes Eat Females? Adults male mosquitoes are not cannibals and will not eat adult female mosquitoes. However, in their earlier stages of life, some mosquito species will be cannibalistic, in which case males are likely to feed on females in a larvae stage in order to survive. So yes, male mosquitoes can eat females in some cases. However, you must know that these cannibalistic tendencies only happen in very few species and only in the first stages of the lifecycle. They will only eat each other in the water, not in the air. If you want to learn more about the stages which these little bloodsuckers go through, I’ve written something cool about that as well! In this article, you’ll learn all about the mosquito life cycle and how long it takes for them to become adults. It will help you understand a lot about what they go through before they end up sucking your blood. So, now you know that there is a lot more to those annoying little pests than first meets the eye. Males are actually a lot different from female insects in many ways, but when it comes to food, both have their eyes on the thing people tend to enjoy too. I’m talking about sugar, obviously. Because that’s really all these creatures eat for survival. Not even the females will eat blood, they really only use it to lay eggs. Surprising, isn’t it? Either way, I’m very glad you took the time to learn about your enemies, because they are both the most fascinating and annoying things on Earth in my opinion. Females should be the ones to target for killing, and I’ve got just the tools to get you started. On my anti-mosquito product overview page, you’ll find some of the most effective tools and remedies against bites, or even the mere presence of mosquitoes in and around your house. And might it have been the case that you’ve already been mitten, that page will also give you a good solution. So check it out and let me know which solution worked best for you. Happy hunting!